Accidental Epicurean was named by Flipkey, a vacation rental site from Trip Advisor, on a list of top-25 Culinary Travel Blogs to Watch in 2014. We find ourselves in good company on the list with lots of fantastic blogs from the very focused blog about a guide to food carts in the USA to very international writers with foodie recommendations from the Caribbean and Mexico City to London and France. As most of you already know, Accidental Epicurean is focused on the culinary world in Asia, so you can continue to find the best of the best in the Asian foodie scene here. 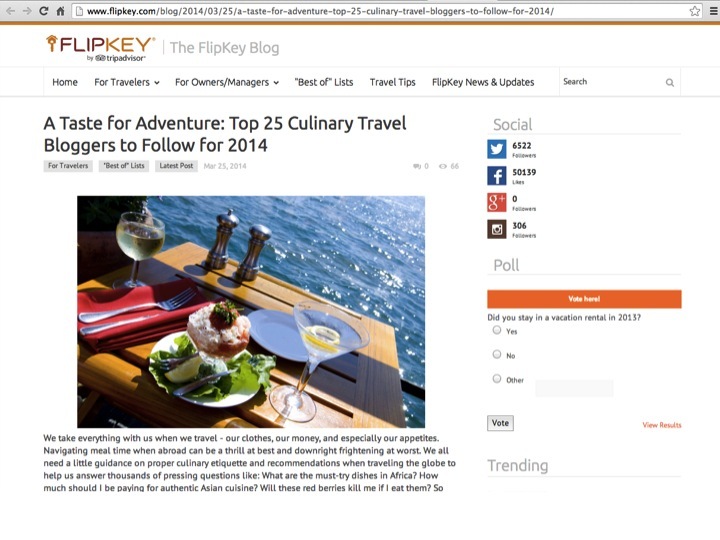 We are always very proud to be recognized and would like to thank Flipkey for naming us as one of the Top-25 Culinary Travel blogs to watch in 2014.